BARIHUNKS ®: One month until Chrismas! Have you bought your Barihunks calendar? One month until Chrismas! Have you bought your Barihunks calendar? 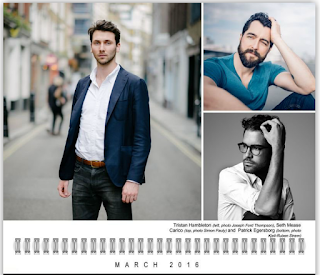 The 2016 Barihunks Charity Calendar is now available for purchase. Now in its fifth edition, the calendar features eighteen of the hottest singers in opera and musical theater hailing from nine different countries. For each of the last four years, the charity calendar has donated all of the profits to young artists, young artist programs and projects featuring baritones. Some of the previous beneficiaries have included the Portland Resident Young Artist Program, Seagle Music Colony, the production of the West Coast Premiere of Ricky Ian Gordon's Green Sneakers featuring Jesse Blumberg, and a concert featuring bass-barihunk Aaron Sørensen and hunkentenor Jonathan Blalock. This year the proceeds will be used to fund the creation of the Foundation for the Advancement of Baritones (F.A.B. ), which will fund baritone and bass cash prizes at song competitions, commission music for baritones and basses, and be used to fund other projects featuring low male voices. New York-based composer Clint Borzoni has already been commissioned to write two songs for string quartet and baritone, which will be performed by Marco Vassalli in January. The singers this year include Cyril Rovery and Romain Dayez from France; Malte Roesner, Eric Stokloßa and Marco Vassalli from Germany; Iurii Samoilov from the Ukraine; Tristan Hambleton from England; Duncan Rock from Australia; Patrick Egersborg from Norway; Jason Forbach, John Paul Huckle, David Adam Moore, Seth Mease Carico and Edward Miskie from the United States; Gianluca Margheri and Vittorio Prato from Italy; and, Iosu Yeregui from Spain. All of the singers are baritones or lower voices, except for Eric Stokloßa, who is the first tenor featured in the calendar (in a photo with baritone David Adam Moore from Peter Eötvös' Paradise reloaded. Four of the singers were photographed this Summer in the Loire Valley in an official Barihunks photo shoot. The Barihunks calendar is available at LULU.com. Fans of Marco Vassalli can purchase his fundraising calendar, which will help fund his long-awaited US debut in San Francisco this January. Click HERE to purchase the calendar or HERE to learn more about the concert. You can also find additional benefits at his Indiegogo campaign, including his CD of Italian songs or the chance to have a newly commissioned song that he's performing named in your honor.